"So you sit home, drinking alone, empty bottle in your hand. You don't even try, to sort out the lies, it's worse to try to understand..."
They are one of the most dark and moody bands I know. Their music gets under my skin and speaks to me. You should check them out if you have never heard them. Below are some links to other peoples pages that are dedicated to the band. My insignificant page could never compare to theirs. Tho I did write a very odd Peter poem that you may enjoy. The coven---where I "borrowed" the above pic!!! The Casket Crew---None more negative!! LeAnne Lassiter--This is a good page!! My Type-O awards and web rings page!! Cuz as any Type-O fan knows Carnivore was the origins of Type-O in a way. Anyway, here is my tribute to Carnivore. Woah Look! 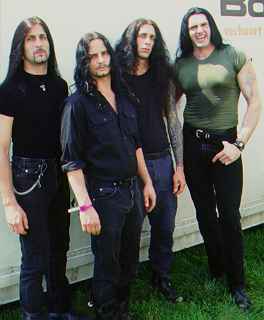 Its Peter Steele!! What a nice looking guy, hehe! Negative fans have visited this page.